When I first arrived here in Brisbane I was excited to try many of the amazing wines I'd heard so much about. However, as I'd just packed and moved across the world, my budget was a bit tight. Having been spoiled in Canada with excellent inexpensive wine from Chile and Argentina, I was initially disappointed in the quality of Australian white wine I was able to get sub $15. The inexpensive white wine market in Australia seems to be flooded with duds. I had no idea where to begin. However, now that I've had some time to poke around, I realize there are some great whites available in this very low price bracket. I've decided to share three of my favourites here, in the hope that it might help others find some of the great value Aussie whites available. Smells like lemon and fresh straw, with a hint of asparagus. Balanced palate with a good amount of citrus. I cannot get enough of Mt. Pleasant Semillon right now. 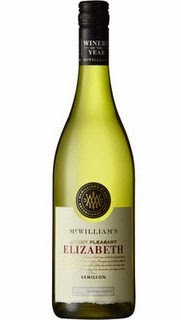 While the 2012 Elizabeth is already a great, readily available, inexpensive option, their aged semillon is amazing and also very reasonably priced. If you can still find the 2006 Cellar Aged Elizabeth, buy it. Generally available for less than $25 and incredible value at this price. Although, rumour has it the 2007 cellar release will be as good, if not better. Gourmet Traveller has named Tom Barry "Young Wine Maker of the Year", and I can see why. Anyone who can produce a Riesling of this quality for this price deserves an award. Great Riesling with lots of citrus. Very fresh and dry, fantastic with east Asian curries, or nothing at all. While discussing Riesling I feel it's only fair to mention that there are many more great Aussie Rieslings available for around $20. In fact, I plan on spending my summer exploring as many of them as possible. I cannot say enough good things about aged Riesling and there are some superb deals to be snatched up at some of the major retailers right now. Every time I get a bottle of of this Marsanne I'm amazed at its simple beauty and easy drinking. I've shared this with many friends who have been impressed with its great value. The Marsanne grape originates in the Northern Rhone region of France and has found a well suited new home at the Tahbilk winery in the Nagambie Lakes region, north of Melbourne Victoria. Wonderful stone fruit, citrus and peach on the nose. Nice minerality and decent length. The best part is that this ages really well, and you can buy vintage Tahbilk Marsannes at a pittance. Some are available at major retailers (I've recently found the 2008 for $18), but I reckon the best bet is to check out their website below and join the club. I've seen packages containing multiple vintages available at great prices.